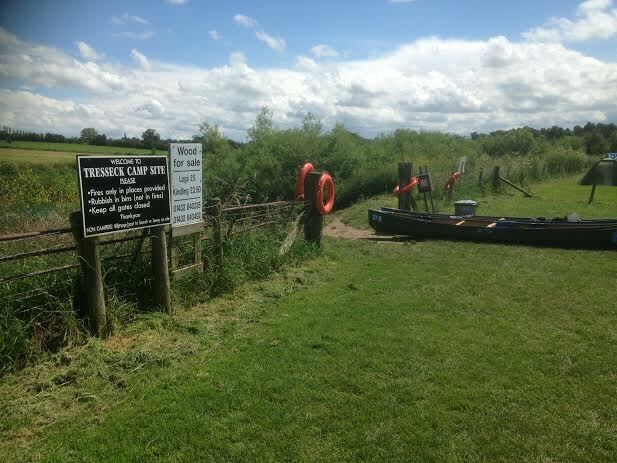 There are two ways to reach Tresseck Campsite, in Hoarwithy, in the Wye Valley, near Ross-on-Wye: by land or by boat. We took the former for our Wye Valley camping trip, an annual gathering of dads and their children. 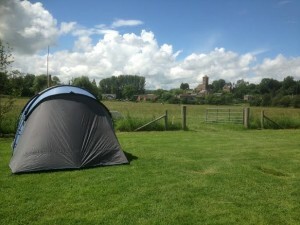 The campsite is based on a river meadow about 200 yards from the small village. Amenities are limited. Basic loos and a standpipe are there for the necessities of life. For anything else though, you need to go elsewhere. But that’s the charm of Tresseck. As soon as you arrive you are overcome by a sense of calm and wellbeing. 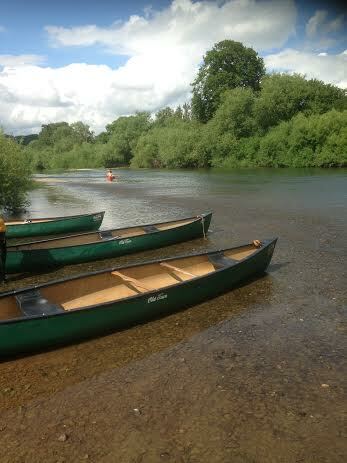 It’s an immensely beautiful part of the Wye Valley. You look one way and you see forested hills, an Italian style church and a few builidings in the background (one of which is the New Harp Inn should you need food and drink) behind a beautiful natural meadow . You look the other way and you see…well …not much. High grasses and shrubs hide the river which passes just a couple of yards away. Then you see a gap between the shrubs, a sign and a short drop down to the river side. There’s a mud slope for those brave enough to slide or scrabble (depending on the weather) , or steps for the more cautious which allow you get onto and into the river itself. 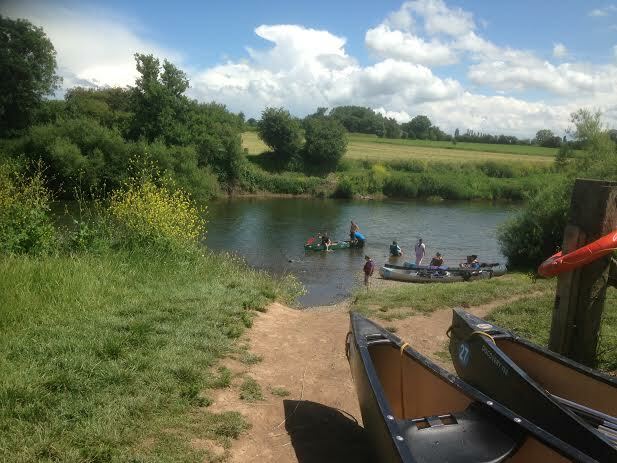 Wait just a short while and you will see Canadian canoes bobbing along with smiling contented canoeists gently dipping their paddles in the river to help navigate the softly running water. 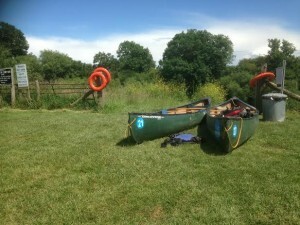 Many canoeists stop at Tresseck campsite overnight. 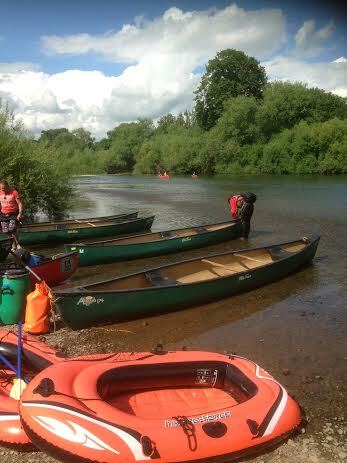 Some have paddled independently. Most though are part of a group organised by one of several specialist canoe companies. They haul their canoes onto the small beach and then up onto the campsite itself. They keep their belongings in round barrel-like containers. Many reach for their mobile phones in their dry sacks, only to find that there is little or no reception at Tresseck… You can sense that people’s initial frustration quickly dissolves, as the peace, calm and tranquillity of the site soon overcomes them. Music is not allowed on site. But camp fires are permitted. The site staff also sell logs and kindling to ensure that you don’t miss out. Sitting round the fire at night, passing around snacks, drinks and marshmallows you wonder why so many other sites which boast all sorts of facilities, prohibit this simple pleasure.